Material: 100% vegan materials from top to sole. Eco-friendly and in control. Measurement: Platform measures approximately 1" Heel measures approximately 0.25 inches. True to size. 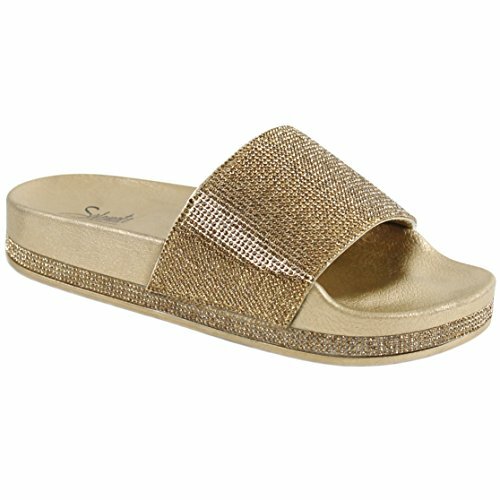 MAGGIE slides are made with an easy to slip on design, molded footbed, an open toe, sparkling glitter single band, and a platform outsole. These gorgeous platform sandals offer balance and stability for all day walking and support on the heel. A must for your wardrobe to add height while keeping you on trend! The construction is designed to give you a secure yet comfortable fit based on the size you choose. Please kindly refer to the size chart prior to selecting. Material: 100% vegan materials from top to sole. Eco-friendly and in control. Measurement: Platform measures approximately 1" Heel measures approximately 0.25 inches. True to size. MAGGIE slides are made with an easy to slip on design, molded footbed, an open toe, sparkling glitter single band, and a platform outsole. These gorgeous platform sandals offer balance and stability for all day walking and support on the heel. A must for your wardrobe to add height while keeping you on trend! The construction is designed to give you a secure yet comfortable fit based on the size you choose. Please kindly refer to the size chart prior to selecting. If you have any questions about this product by Solemate, contact us by completing and submitting the form below. If you are looking for a specif part number, please include it with your message.